Protecting and defending fishers’ rights. Every year, hundreds of thousands of fishers’ around the globe experience exploitation and the abuse of their fundamental rights. The pervasive use of trafficked, slave, forced and bonded labour, together with dangerous working conditions, long hours, and a lack of legal protections for fishers, has left many in need for protection and support and driven many fishers to fight for justice. Wherever fishers are the victims of any form of abuse – at the hands of exploitative owners, or by ineffective government enforcement – we will built power to protect, defend and improve fishers’ labour and human rights. We demand fishers have safe, clean and sanitary working conditions, health and safety procedures onboard, equal rights and equal protection, fair wages, and employment contracts in their own language. We search out the facts, expose what is happening and organise fishers to put pressure on companies, governments and others to stop these violations. 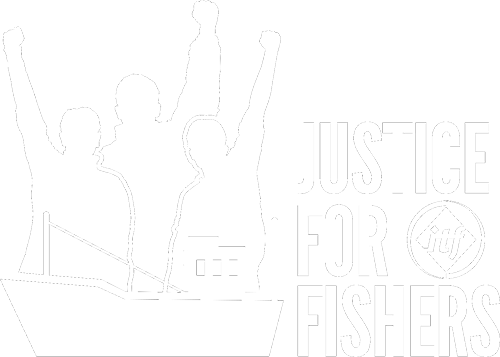 Justice for Fishers is a campaign run by the International Transport Workers’ Federation to promote respect for the labour and human rights of fishers worldwide. Our global team works alongside our affiliate unions to organise, campaign, lobby and expose abuses, standing in solidarity with workers who come under attack. We work to advance and defend the interests of fishers’ globally, organising fishers to grow representation, campaigning against companies failing to protect fishers’ rights, pressuring governments to implement, uphold or change laws to protect human rights, and representing fishers in global bodies such as the International Labour Organisation (ILO) and the International Maritime Organisation (IMO). Fishing is one of the most challenging and hazardous occupations. The ITF’s primary aim is to ensure that all fishers have decent work free from exploitation. Ensuring decent, safe working conditions for all fishers on board fishing vessels with minimum requirements to be enforced through labour inspections in ports around the world. Eliminating forced and child labour, human trafficking and the exploitation of migrant labour in the fishing industry worldwide. Improving occupational safety and health procedures and training for fishers on vessels, including emergency medical procedures and first aid training to treat injured or sick fishers at sea. Ending informal work practices and ensuring that fishers have the protection of a written work contract and social security benefits irrespective of their nationality. Pressuring governments to ratify and strictly enforce the ILO Work in Fishing Convention, and strengthening national laws and policy and regulatory frameworks. Holding companies accountable to any exploitation and abuse to raise labour standards and establish a complaints mechanism across global supply chains. Promote respect for trade union and human rights worldwide so that any fisher, anywhere in the world, is free to join, lead and be active in their union. The International Transport Workers' Federation is a democratic global union federation of 670 transport workers trade unions representing over 20 million workers in 140 countries working to improve the lives of transport workers globally.